An innovative concert by the Philadelphia Orchestra highlighted the roles of faith and music in overcoming grief. “Music of Faith,” presented on Jan. 24 and 25 in the Kimmel Center’s Verizon Hall, paired two works rarely performed together: Symphony No. 3 (“Kaddish”) by Jewish composer Leonard Bernstein, and “Stabat Mater” by Catholic composer Gioachino Rossini. The works explore the themes of loss and suffering through the lens of their composers’ faith traditions. Bernstein invokes the Kaddish, a traditional Jewish prayer for the dead that dates from the 13th century. Written in Aramaic, the Kaddish (the title of which means “sanctification”) does not specifically mention death, but instead affirms the greatness of God and pleads for peace. Like Bernstein, Rossini also drew on a medieval text, reframing the Latin hymn “Stabat Mater Dolorosa” (“The sorrowful mother was standing”), which describes Mary’s suffering during Christ’s crucifixion. The orchestra was joined by a number of internationally renowned soloists, as well as narrator Charlotte Blake Alston and the Philadelphia Boys Choir. The diversity of performers and audience members complemented that of the repertoire. 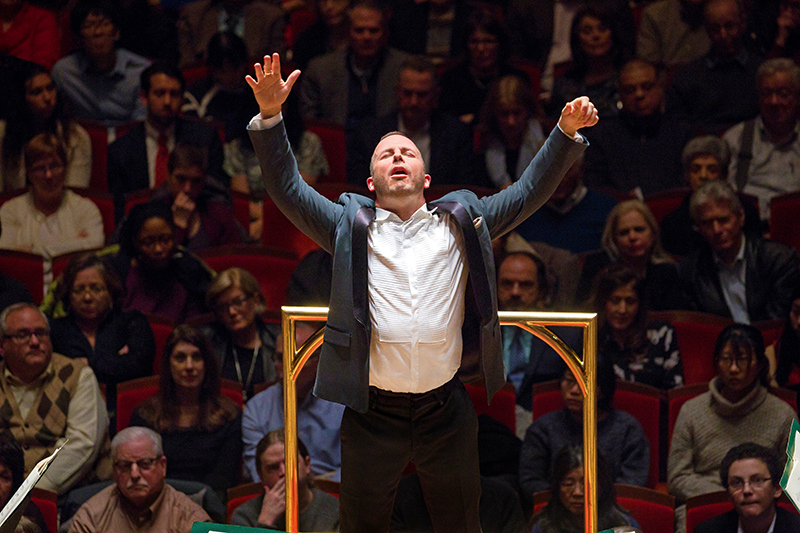 The selection of the program’s particular pieces was timely, said Nézet-Séguin, noting that the orchestra has focused on the music of Bernstein during his centenary year. In addition, “Rossini’s ‘Stabat Mater’ is a deeply moving work that has been a dream of mine to bring to Philadelphia,” said the conductor, who led the Philadelphia Orchestra during the papal Mass at the 2015 World Meeting of Families. Interestingly, “neither Bernstein nor Rossini were particularly religious,” but “spirituality was very important to them,” especially Bernstein, said Nézet-Séguin. While the composers attained most of their success through stage works (“West Side Story” for Bernstein, numerous operas such as “Barber of Seville” for Rossini), “both expressed some of their deepest, most inspiring music in these works of faith,” Nézet-Séguin said. Revisiting music of the past helps to clarify the present, he added.